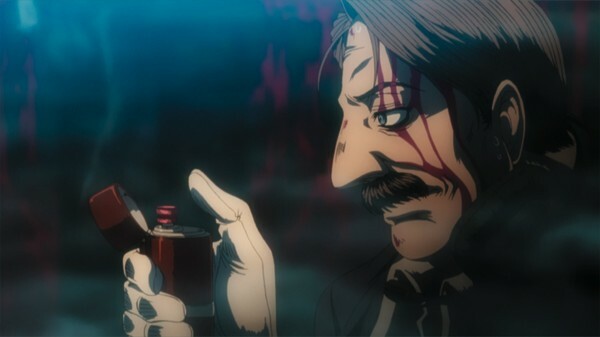 As many fans would probably know by now, Hellsing Ultimate, the well known and much loved successor to the original Hellsing anime series, recently made the jump to Blu-Ray release in Oceania. 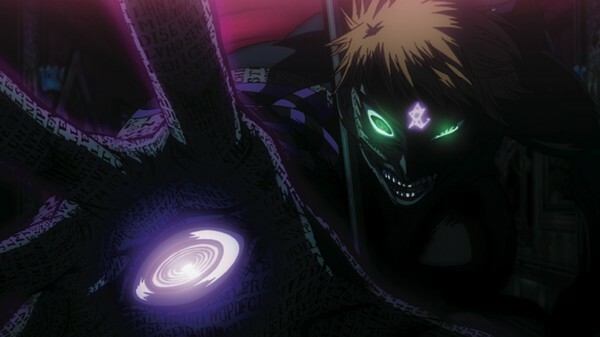 This is a series that has become well known for its up-front level of violence, surprisingly deep and structured character development as well as the creation of one of the most sadistically popular anime badasses of all time. 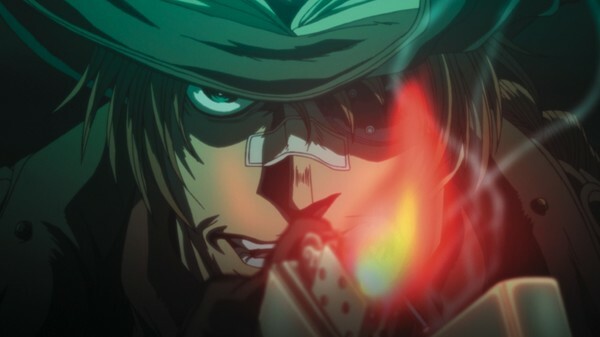 Hellsing Ultimate is designed to appeal to a certain special variety of anime fan. These are the fans who laugh maniacally at the feast of violent madness that is so consistently offered throughout the course of this series. So far, two Blu Ray collections have been released, containing OVA episodes I-IV and V-VIII respectively. A review of the first collection can be found on our site here. If you were a fan of the first collection for the afore mentioned reasons, then you’d best be prepared for what collection 2 makes to offer. The box art for collection 2 has been outfitted with a shiny black R18+ rating, which is a promise of a step UP in violent content in comparison to collection 1’s MA15+. Long time fans will already know what they’re in for, so the real question is: how does the Blu Ray Collection 2 stack up? 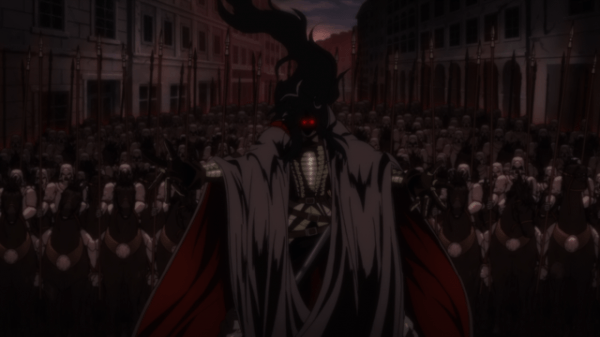 In the first collection of Hellsing Ultimate, new viewers were introduced to Alucard; an honor bound vampire lord whom had sworn an oath to serve an order of Protestant Knights known as the Hellsing Organization. In their quest to protect the world from numerous supernatural forces, Alucard serves as the organizations ultimate weapon. 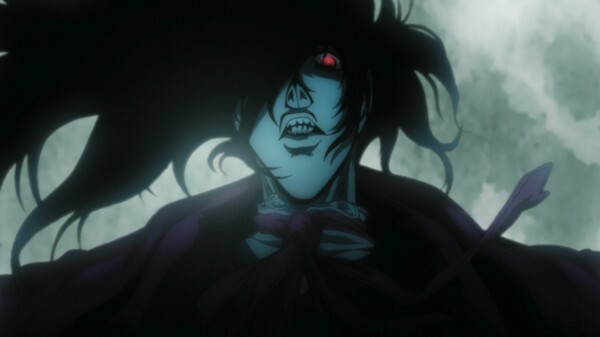 Audiences were also introduced to Seras Victoria, Alucard’s vampire fledgling who was still coming to terms with her new status as a member of the living dead. The events of the first collection revolved around the pair being dispatched to investigate and VIOLENTLY put down a number of supernatural insurrections around the world. Throughout their battles, one thing had become abundantly clear: that an enigmatic group called Millennium was orchestrating these events for some yet unknown grand design. Collection 2 opens with Millennium on the cusp of launching their major assault on London. With only the Hellsing Organization standing in the way of their mad slaughter of millions, the enigmatic ‘Major’ sends an elite attaché of Nazi Zombies to strike at the beating heart of the organization. At the same time, the Iscariot Organization gears up to take on Millennium with an army of their own, though their intent is quickly revealed to be more sinister than their catholic makeup belies. Close to the end of the collection, each of the three groups: Hellsing, Iscariot and Millennium, reveal their respective “trump cards”, creating one crazy three-way confrontation. 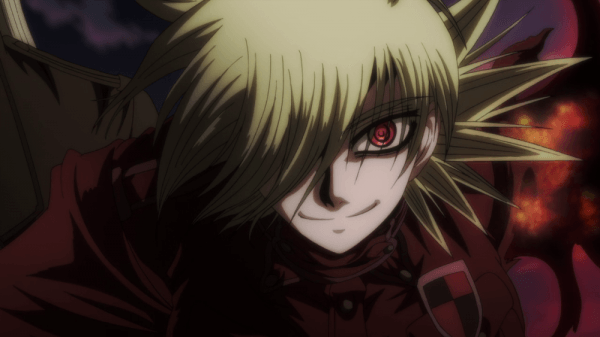 Many characters of the series undergo a significant amount of character development in this collection, chief among them being Seras. Her struggle with her clashing human and vampire nature’s reaches a head, and her role quickly changes from that of a comedic support character to one of the most badass chicks in anime history. On the other hand Alucard’s role in the series is very much downplayed in this collection, only making an appearance in the final episode. However, this protagonist’s lack of screen time is quickly made up for when Alucard reveals his most powerful ability, known as “Level Zero”. This revelation also comes with a significant dose of character development and an explanation as to why a vampire as powerful as he is bound to the will of humans. Where the first four episodes of collection one dealt with character introductions and contextual set up, the episodes of Collection two are centered on what is widely considered to be the major conflict of the series. All four episodes are structured in an arc style of storytelling, unlike the episodes of Collection 1 which featured more one-shot standalone episodes. Even so, the story still flows at a well considered pace. Despite the abundance of over-the-top action sequences, such scenes are broken up by some very well written transitional dialogue which serves to not only let the viewers metaphorically “catch their breath” but also heighten suspense at the next action scenes to come. And with a series so intently focused on delivering fast paced, bloody action, this effect makes the viewing experience all the more attention grabbing. 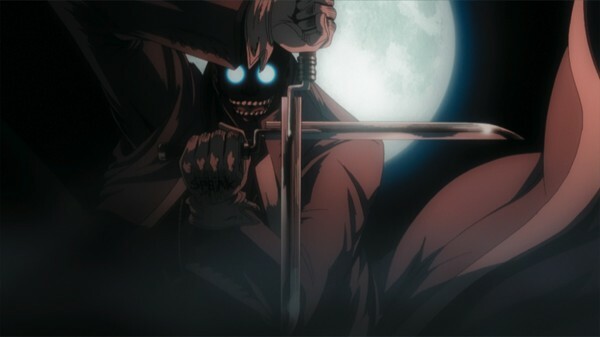 The presentation of Hellsing Ultimate in Blu Ray is nothing short of amazing. Much like the first collection, the presentation of a series that is still a good five years old still stacks up, and in fact outshines many other anime series of the modern day. Character modeling is handled with a great amount of care with its detail, as is the manner in which said characters are bloodied, torn apart or liquefied in action sequences. Each character’s design is handled in a way which exemplifies their individual visual characteristics, which are at their richest in looking at Alucard’s and Seras’ transformation forms. After each transition, you can still tell that they’re the same character, but the look and feel of both is completely different. If there would be a single colour that viewers are liable to get used to seeing, it’s RED. The fires of London and the bloody execution of violence will provide exposure in droves, which contrasts very strongly against the dark drawn backgrounds. Speaking of which, the background detailing is similarly well presented, highlighting a great visual juxtaposition between the colorful foreground elements with dark environmental ones. With the exception of confusing elements of mangled anatomy, there is never a scene where the viewer can’t visually discern what is going on. The soundtrack of this collection is very much on par with that of the first collection, though the themes associated with action sequences do feel much faster paced to compliment the rapid deliverance of action. The increased intensity of the musical scores appropriately fit the increase in pace and euphoria as the bloodiest battle yet takes place. Voice acting is equally as well handled in this second collection as it was in the first. The English translations are still performed exceptionally well, with a hugely respectable performance going to Crispin Freeman once again. However, this time around Katherine Gray and Steven Brand steal the show for their portrayals of Seras and Anderson, whose character performances really shine given their great level of development, and for continuing to nail those British and Irish accents without making them sound forced. As is standard for a Madman DVD and Blu Ray release, Hellsing Ultimate Collection 2 is filled with a variety of bonus features. Of course the standard episode commentaries, trailers and textless openings are present, as is standard fare. The collection also contains a special round table segment which addresses both fan questions of the series creators and voice actors. A dubbing session for the show is also shown in a part of this presentation, which gives fans a great insight into what things are like behind the scenes in a recording environment. The bonus features also includes a special panel event in Las Vegas 2010 for AnimeVegas, and most interestingly of all, a special subbed “prequel” episode called The Dawn, which explores the roots of the conflict portrayed in this collection, as well as the presence the Hellsing Organization had in one particularly famous conflict in human history. Like the first collection, if you enjoy your series extras, you won’t be disappointed. Hellsing Ultimate Collection 2 takes everything from the first collection and makes it a faster, bloodier and crazier than the first. This series still remains a joy to watch from beginning to end with its intriguing characters; unique world perspective and challenging what some are liable to consider heretical views. Each episode will keep you fixated and wanting to see more, a feeling which is exemplified at the end of this collection’s events. Nonetheless, the madly maniacal rush of adrenaline you will get from this series is something which has yet to be challenged or reproduced in any series, and is something that truly must be experienced.